1.1 What is THE SUB®? THE SUB® is the innovative home tap from HEINEKEN® and Krups®, designed by the highly acclaimed industrial designer Marc Newson. Select your favourite beers from around the globe, place the TORP® in THE SUB®, and enjoy delicious, freshly tapped draught beer. 1.2 Where can I buy THE SUB®? You can buy THE SUB® in THE SUB® section of our website. 1.3 What are the dimensions of THE SUB®? THE SUB® is 45.5cm (excluding drip tray) x 23.5cm x 32.6cm. THE SUB® weighs 6.8 kg. 1.4 What are dimensions of THE SUB® Compact? THE SUB® Compact is 45.3cm (excluding drip tray) x 19cm x 37.5cm (l x h x d) and weighs 4.45kg. 1.5 Is THE SUB® battery powered or do you plug it in? THE SUB® plugs into the power outlet with a 90cm power cable. It’s extremely energy-efficient with a rating of A+. 1.6 Should I leave THE SUB® plugged in? When there is a TORP® in THE SUB®, it should stay plugged in in order to keep the TORP® perfectly chilled and ready for use. We recommend unplugging THE SUB® when it doesn’t have a TORP® installed. 1.7 How energy efficient is THE SUB®? THE SUB® has an energy label of "A+". This means this is one of the most efficient appliances within the home draught system category. THE SUB® uses an average of 10 Watts in a “steady state.” This means the home temperature is 20-22°C, the TORP® is pre-chilled to 2°C, and THE SUB® is not pouring. It is comparable to an unopened refrigerator. 10 Watts is the same as a usage of 0.010 kWh per hour. THE SUB® Compact uses an average of 11 Watts in a “steady state”. On an annual basis, when THE SUB® is switched on all year, the energy consumption in the "steady state" is approximately 87.6 kWh. 1.8 What is THE SUB® made of? THE SUB® is made of glossy plastic, and its drip tray is made of plastic. 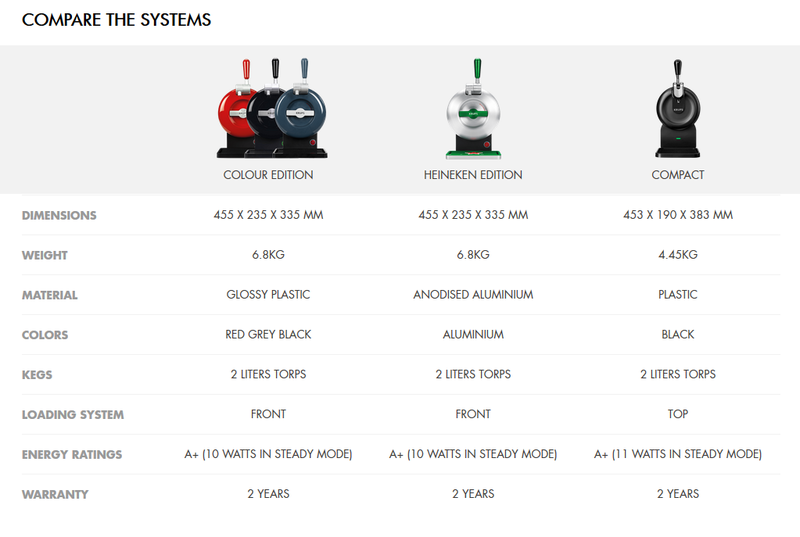 THE SUB® Heineken Edition is made of anodised aluminium, and its drip tray is made of anodised aluminium and silicone. THE SUB® Compact and its drip tray are made of plastic. 1.9 What does THE SUB® come with? All models of THE SUB® come with a drip tray. TORPS®, skimmers, and other accessories are sold separately. 1.10 Can I load a store-bought beer cans or kegs into THE SUB®? No, THE SUB® Is designed specifically to hold TORPS®, which can be purchased here. 1.11 How do I know when my beer is ready to pour? Once your beer is chilled to the right temperature, the light on the front of THE SUB® will turn green. Tapping a beer before the TORP® is completely chilled will produce a lot of foam. We recommend waiting until the green light is on. To pre-cool your TORP®, set the fridge at the lowest temperature and put the TORP® on the lowest shelf (this is the coldest area) for 6 to 10 hours, or until the cold indicator on the TORP® turns blue. 1.12 How do I load a TORP® into THE SUB®? Pull off the top of the TORP® sleeve along the dotted line. Then take off the cap and take the tube out. Push the tube into the opening of the TORP® until you hear a "click" sound (this may take a little force). Slide the TORP® into the cooling chamber of THE SUB®. Make sure you push the TORP® completely to the end of the appliance. Then open the tap cover and guide the tube into place. Snap the beer valve in its position in the tap head. Close the tap cover, close and lock THE SUB® door and leave to chill. Check out our How it Works guide for a visual and more information. 1.13 Is it possible to regulate the temperature of THE SUB®? THE SUB® chills to 2–6°C and can't be set to any other temperature. 1.14 THE SUB® makes a noise when I pour – is this a problem? This is perfectly normal. THE SUB® is fitted with a pump to keep the TORP® under pressure. During use, the pump will start up automatically, generating a sound that will stop after a few seconds. THE SUB® makes a noise level of 25DB. 1.15 THE SUB® makes a noise while cooling the TORP® – is this a problem? This is perfectly normal. THE SUB® will adjust temperature to keep your beer perfectly chilled, so you may hear its cooling fan working! THE SUB® makes a noise level of 25DB. 1.16 My SUB® keeps pumping/making noise, but no beer is coming out. It can be that the TORP® was not inserted correctly and has not correctly activated the pressurizing mechanism. Please remove the TORP® and try inserting it again. Our Craft TORPS® are a few millimetres smaller than our regular TORPS®, which is why we include a plastic clip with them. Please make sure that you have placed the clip on the TORP® – simply insert the tube into your TORP®, then slide the clip over the top of the neck of the TORP®. This will help the TORP® fully activate the pressurizing mechanism. You can also remove this clip once you have finished the TORP® and re-use it on your next TORP® if needed. 1.17 I’ve poured a beer, but it is mostly foam. A foamy flat beer is usually due to the fact that the TORP® is not cold enough. Using a pre-chilled TORP® will speed up the cooling process to 2°C. To pour the perfect beer, we recommend holding your glass at a 45° angle, and close to the nozzle of the SUB. Turn your glass back to a 90° angle just as your beer reaches the edge of your glass, and fill until the glass is full. It is okay for the beer to flow over just a bit, as this will ensure you get the perfect beer to foam ratio – just make sure your drip tray is underneath your glass! You can find an instruction video on how to pour the perfect beer here. 1.18 How do I clean THE SUB®? Unplug THE SUB® before cleaning the inside and outside with a soft cloth. Use a damp cloth to clean the cover and a dry cloth to clean the cooling chamber. THE SUB® should never be immersed in water. Harsh cleaning products may damage THE SUB®. Clean the drip tray with warm, soapy water after every use. We recommend cleaning the tap every time you load a new TORP® to avoid contamination and mixing different beers. You can find an instructional video for cleaning THE SUB® and THE SUB® Compact here. 1.19 Is there a loyalty program for THE SUB®? There currently is no loyalty program for THE SUB®. We’re looking into ways to reward our loyal customers and plan to have a rewards program in place as soon as possible. In the meantime, we encourage you to sign up for our newsletter and follow us on our social media channels to receive special offers, updates on new products, opportunities to receive free samples and more. You can subscribe right below in the footer of the website. If you received an insert in your SUB® package about registering your device, please Contact Us. It is no longer possible to register TORPS®. We apologize that the information on the quick guide that accompanies THE SUB® is not yet updated. 1.20 What is the difference between THE SUB® and THE SUB Compact®? The differences in terms of function between our SUB® models are displayed below. All models are made to function with all of our TORPS®. The aesthetic differences are that the SUB® Compact is slightly smaller in size and is loaded from the top, THE SUB® is loaded from the front. In addition, the light on the SUB Compact® is not an on/off switch as it is on THE SUB® - it is turned off by unplugging the device. 1.21 My SUB® did not come with the tube to connect my beer. The tube that is inserted in the tap is located in the cap of each TORP®, and should not be taken out of the TORP® once inserted. 1.22 I would like to order 10+ SUBS® for my business. For an order of 10 or more SUBS® for your business please contact: partnerships@onlinedrinks.com (TORPS®, BLADE®, Beertender®, and accessories excluded). 1.23 I lost my SUB® user manual. Where can I find it? The SUB® user manual is delivered with the appliance. You can also download it here. You can also download The SUB® Compact user manual here. 2.1 How much beer is in a TORP®? A TORP® holds two litres of beer. This corresponds to about eight 25cl glasses. 2.2 Where can I buy TORPS®? The complete range of TORPS® is available in the BEERS section of our website. TORPS® can be purchased on our website, they are not available offline. We also occasionally have deals on Amazon. 2.3 What brands of beer are available? The full range of available beers and their prices are listed in the BEERS section of our website. The selection of beers we offer may vary per country, and we’ll be introducing new beer brands over time. 2.4 The product I would like to buy is sold out. When will it be available again? Besides seasonal beers, we regularly replenish our products, please subscribe to the email notification to receive an alert as soon as the product is available in our webshop again. This can be found at the bottom of the page of our website. 2.5 Can I use TORPS® with other home draught appliances? No, TORPS® are designed specifically for THE SUB®. 2.6 What are the dimensions of a TORP®? 2.7 Does a TORP® expire? We guarantee good beer quality of fully sealed TORPS® for 2 months after purchasing from our website. Once you’ve opened your TORP®, the beer is guaranteed to stay fresh for 15 days, if stored in a running SUB. You can find the best-by date on the side of your TORP®. We guarantee the quality of the beer through the end of the month noted. After this date, quality may decrease. In general, we recommend storing your TORP® in a cool and dry location, for instance the fridge. That will ensure the best beer taste and experience. 2.8 How should I store TORPS®? Before use, keep TORPS® in a cool, dark place. If there's room in your fridge, keep a spare TORP® chilled and ready to use. Set the fridge at the lowest temperature and put the TORP® on the lowest shelf – this is the fridge's coldest area. DO NOT PLACE THE TORP IN DIRECT SUNLIGHT, STORE THE TORP BELOW 30 DEGREES, OR FREEZE THE TORP. 2.9 Can I put TORPS® in my freezer? No. The TORP® should not go below zero degrees as this may damage the packaging and cause beer leakage. You will no longer be able to use the TORP once frozen. 2.10 How long does it take to chill a TORP®? Once in THE SUB®, cooling down a TORP® takes 10 to 16 hours (depending on starting temperature of the TORP® as well as the ambient room temperature). When your beer is chilled to the right temperature, the light on the front of THE SUB® will turn green. To speed up the process, set your fridge at the lowest temperature and store the TORP® on the lowest shelf (this is the coldest area) for 6 to 10 hours, or until the cold indicator on the TORP® turns blue. 2.11 Why is my TORP® taking so long to cool inside THE SUB®? The temperature of the TORP® depends on the temperature in the fridge and the time the TORP® has been in the appliance. If the temperature of the room is above 30 °C and the TORP® has not been pre-chilled, it can happen that the light does not turn green. The temperature of the beer in this case is within 2 – 6 °C and still cooling. As long as the TORP® has been in THE SUB® for a couple of hours, it is not a problem that the light is still red. 2.12 Can I swap out a TORP® before it is empty? Once a TORP® has been opened, you need to keep it in THE SUB® and keep THE SUB® plugged in. This will keep the beer at the right pressure and freshness. You can take the TORP® out before it is empty, but once removed it should not be consumed. 2.13 Can I open a TORP® and serve the beer like a can or glass bottle? No, the TORP® is specifically designed to be used with THE SUB®. The beer inside the TORP® needs to be kept under controlled pressure, otherwise the beer will not be the quality you would expect. Piercing the TORP® is not recommended as the sudden change in pressure could cause it to rupture. 2.14 What should I do if my TORP® leaks? The TORPS® are sturdy, but they could leak if they freeze or are punctured. If you have a TORP® that was leaking when you received it, please contact our Customer Care team. 2.15 The TORP® fell, there is a leak. If you notice a leak, the TORP® is no longer usable. If you have a TORP® that was leaking when you received it, please contact our Customer Care team . 2.16 Can the TORP® be transported? Yes, over reasonable distances and as long as the transport does not incur high variations in altitude and therefore too much pressure. Nevertheless, once at your destination, it is better to let it rest a few minutes before use. As the beer may have been shaken about, you must let the foam settle back down. Please note, the TORP® is not transportable by plane, because of the significant variation in altitude and therefore pressure. 2.17 The TORP® fell but it does not look damaged. You can, in principle, still use this TORP®. It is better, once the TORP® has been straightened back up, to let it rest for about ten minutes before use. 2.18 How can I register my TORPS®? It is no longer possible to register TORPS®. We apologize that the information on the quick guide that accompanies THE SUB® is not yet updated. We’re looking into an updated way to reward our loyal customers and plan to have a new rewards program in place as soon as possible. In the meantime, we encourage you to sign up for our newsletter and social media channels to receive special offers, updates on new products, opportunities to receive free samples and more. You can find it at the bottom of the page of our website. 2.19 I put a TORP® bundle in my basket, but the numbers don’t match the listing. The missing TORP® is counted as the main product, and the remaining number adds up for the rest of the bundle. For example, you may see a bundle of 8 TORPS®, but in your basket it may show a count of 7. This is because the 8th counts as the main product and is not listed as the additional TORP®. This is due to a system limitation which we are planning to resolve in the near future. 2.20 I want to create my own TORP® bundle. Unfortunately our current system limitations do now allow customers to choose their own TORP® bundle items. This is an option we would like to have in the future and are working on, but we cannot currently provide. 2.21 Is the TORP® recyclable? The TORP® is made of PET plastic, and the recommendation is to dispose of the TORP® in an appropriate plastic waste stream. Actual realisation depends on local collection systems and policies in place. 3.1 What is Craft beer? Our craft beers refer to TORPS® from brands that own clear craft credentials and identity, telling a story about origin, beer taste/ingredients, brewing process, and brewer. 3.2 Is the beer unpasteurized? Yes, our Craft TORP®s are unpasteurized, which also means these TORPS® have a shorter shelf life than our regular selection. 3.3 Does the beer need to be kept chilled at all times? The Craft TORP® supply chain is designed to keep the beer cold during filling, transport to our logistics hubs and during storage. It is important to cool the beer once received by the customer. During last mile delivery the beer is not actively cooled and experiences ambient temperatures. Since this is only during a limited period (maximum a few days) the beer will still be of brewery fresh quality upon delivery. 3.4 Why is Craft beer more expensive? The Craft TORPS® are not shipped in the same way as the regular TORPS®. Craft TORPS® are handled via a cooled supply chain and filled in small batches. All that, together with the fact that the craft liquid is more expensive, means that the costs of the Craft TORPS® are substantially higher. 3.5 Why does Craft beer have a shorter shelf life than the other TORPS? The Craft beers are unpasteurized which is the reason for the shorter shelf life. We guarantee good beer quality of fully sealed TORPS® for 21 days after purchasing from our website. Once you’ve opened your TORP®, the beer is guaranteed to stay fresh for 15 days, if stored in a running SUB. You can find the best-by date on the side of your TORP®. In general, we recommend storing your craft TORP® in a cooled fridge. That will ensure the best beer taste and experience. 3.6 What is the clip on my Craft TORP® for? 4.1 What is the best way to care for my beer glasses? Glasses should not go into the dish washer as this could ruin any logos printed onto the glass. We advise to rinse with hot water and soda, then rinse well with hot water. 5.1 What are the advantages of an account? 5.2 How can I create an account? tick the box: "Create an account for your next visit"
After these steps, you are able to login at the top on the right hand side of the page by clicking the "my account" button. 5.3 Do I have to create an account to place an order? Creating an account is useful but it is also possible to order without an account. If you do not tick the box "Create an account for your next visit", you will order as a guest. 5.4 How can I update my personal information? You can view, edit and delete your personal data in the account section. 5.5 I lost my account login information (username & password). Your username is the email address you used to create your account. Use the same email address to reset your password. Reset your password by clicking on ‘forgot my password’ on the login page. 5.6 I can't sign in to my account. How can I reset my password? You can reset your password by clicking on ‘forgot my password’ on the login page. 5.7 How can I remove myself from your email list? You can edit your communication preferences under the ‘Newsletters’ section of Your Account, or contact our Customer Care team. 6.1 What payment options do I have? Payment on our site is secured with up-to-date security standards. 6.2 Is there a minimum order value? The minimum order value is €15. If you are using a discount code for your order, the total must still be at least €15 after the discount is applied. 6.3 Can I save my payment details for next time? Not everything. You can save your address, but not your specific payment details. 6.4 Where are my payment details stored? We use a secure third party payment provider (Ingenico) to ensure that your payment details are kept safe. We do not store any of your payment information on our site. 6.5 Can you guarantee that my payments will be secure? We use a secure third party payment provider (Ingenico) to ensure that your payment is processed in a secure manner. Please see our Terms & Conditions for more information. 6.6 When trying to place an order, I receive a notification that payment is not possible. Check whether the information you entered contains any errors and try again, or try a different payment method. If you need assistance, feel free to contact our Customer Care team. 6.7 Who can I contact if the price on my invoice does not match my order total? If you have problems with invoices or payments, please contact our Customer Care team. 6.8 I have a voucher, but it is not working. Vouchers have an expiry date, can be limited to a specific category (for instance Beers) and cannot be applied in combination with other promotions. 6.9 Where can I find my invoice? Your order confirmation is sufficient to claim warranty. Should you wish to receive an invoice, please contact our Customer Care team. 7.1 What delivery options are available? The delivery options, shipping times and costs offered during checkout may differ based on your specific shipping address and the items selected. Standard delivery: delivery within 2 to 4 working days when ordered before 3 pm. Delivery speed is dependent on shipping address. 7.2 How much does delivery cost? If you order above €45, you will get FREE standard shipment. Please note that the minimum order value in the web shop is €15. 7.3 How can I track my order? You will receive a shipment confirmation via email with a link to track your order. 7.4 Who should I contact if there's an issue with my delivery? In case your order has arrived damaged or incomplete, please contact our Customer Care team within 24 hours after receipt of the order. Please include a picture of the defect and your order number in the email, this way we have all the information to solve this for you. In case the parcel should have been delivered according to the tracking details, but you did not receive it, please contact our Customer Care team within 24 hours after the tracking states the parcel has been delivered so we can take the necessary steps. 7.5 I only received part of my order; what should I do? Depending on the volume, your order can be shipped in multiple parcels. The shipment confirmation email is designed to show all tracking numbers for your order. You can also track your shipment via your order number on the UPS tracking site, using your order number (SUBPT-ORD######) as the reference. - fill in your order number at "track by reference"
-UPS will show all related tracking numbers. It is possible that UPS may deliver part of your order to a UPS Access Point. You can find the information about the delivery location if you click “View Details” Under the tracking status of the parcel in UPS. You will be able to pick up your parcel from the Access Point. 7.6 Can I have my order delivered to an address that is different than my billing address? Yes - you can have your order delivered wherever you like within the Lisbon district. You can save multiple addresses in your profile for easy access in future. 7.7 Can I have deliveries shipped internationally? You can ship our products to the following European countries: Germany, Austria, The Netherlands, Italy, Belgium, Luxemburg, Spain, Portugal, the United Kingdom, and Switzerland. We do not currently deliver anywhere else. Please order on the country specific page you want your order delivered to. You can change the country of the store by clicking on the world symbol in the menu of our website. 7.8 Can I cancel my order? Our warehouse is set up to process your order as soon as possible, which prevents us from cancelling your order. If you do not want to receive your order, please refuse the delivery and the shipment will be sent back to our warehouse. In case this is not possible, please contact our Customer Care team for the return instructions. As soon as our warehouse has received and processed your return, the money will be refunded to the account you used to place your order within 14 days after the return has been received by our warehouse. 7.9 Can I make changes to my order? Unfortunately it is not possible to change your order after it was placed. Should you wish to order different products, please refuse the delivery or contact our Customer Care team for the return instructions. The money will be refunded to your account within 14 days after the return has been received by our warehouse, and we kindly request you to place the correct order in our webshop. 7.10 What happens if I am not at home when the order is delivered? If no one is available to accept the delivery, our third party delivery provider will leave a note stating that delivery was attempted. This note will indicate at which UPS Access Point location the goods will be stored and can be collected by you. The details of the location can also be found in your tracking details. If the goods have not been picked up at the UPS Access Point location within 10 working days, after failure of the delivery, your goods will be returned to us. We will contact you to ask if you want a re-delivery or a refund. We will refund within 14 days after the return has been received and processed by our warehouse. 7.11 How can I return the products? We are sorry to hear that the product or the delivery does not meet your expectations. You can return your order within 30 days after you receive the package. To return your order, you just need to let us know that you have decided to do so. Once we receive your cancellation our Customer Care team will contact you as soon as possible to arrange a UPS pickup service. No shipping costs are incurred by the customer in this case. Please include a copy of the Cancellation Form or packing slip in the parcel so we can link the parcel to you. please note that returns without the packing slip might not be processed due to missing information. In case your order has arrived damaged or incomplete, please contact our customer care team within 24 hours after receipt of the order. Please include a picture of the defect and your order number in the email, this way we have all the information to provide you with a suitable solution. Please note that you will be responsible for the costs of return if you decide to return the product(s) without contacting our Customer Care team for the return instructions. The return shipment takes place at your own risk and your own cost. We advise you to save the documentation containing the tracking information of your return shipment. Please contact the carrier in case the parcel did not receive our warehouse. Any credit that becomes due as a result of your returned shipment, will be transferred within 14 days after the return shipment has been received and processed (we will transfer the amount due to the account that was used for the payment of your order). 7.12 When I accept my delivery, do I need to prove that I am at least 18 years old? Yes, the person who accepts delivery must be able to prove that he or she is at least 18 years old. 7.13 My order is a gift. Is the packaging discreet? Our packaging is discreet and the invoice is not included in the box. 7.14 My order shows as “delivered” but I have not received it. It is possible that your order has been shipped in more than one parcel. It can happen that UPS delivers different parcels on different days, even if they belong to the same order number. If UPS is unable to deliver to you, it may be that they have delivered your parcel to a UPS Access Point where you can pick it up. In that case, you can find the location of the UPS Access Point in the tracking link. For a detailed overview of the shipment of your parcel, please click the “View Details” option under the status of your parcel on the UPS tracking site. You can also choose “detailed view” within the “Shipment Progress” box for a more in-depth explanation of where your parcel has been. If you have checked these options and are still unable to determine where your order is, please contact our Customer Care team. 8.1 I would like to claim my warranty. Krups® grants a two year warranty on THE SUB®, starting from delivery date. Claim of warranty may lead to repair or replacement. You may return your unused SUB® within 30 days for a full refund (see article 8.10). If you experience problems with your SUB® within the first two years after purchase, please contact our Customer Care team. Please include pictures of the defect, a detailed description and your order number. In case your SUB® needs to be repaired, we will provide you with a return label or you can send it to a GroupeSEB repair centre nearby. Repairs on average take between 14 to 21 business days starting from the day we receive your device at our repair centre. More information about the warranty can be found in our Terms & Conditions. The Krups International Limited Guarantee can be found here. 8.2 What is your warranty policy? You can find information on our product warranty under section 2.11 of the Terms & Conditions . Krups International Limited Guarantee can be found here. 9.1 How can I contact the Customer Care team? If you have any questions or comments, please contact our Customer Care team. We are available on working days from 9am to 4pm at contact@the-sub.pt or by phone at 800 60 10 86. Please note we are closed on bank holidays. In case your question is related to an order, please include your order number. 9.2 I have a complaint, who can I contact? We are working very hard to deliver a great experience to all our customers. If you are experiencing issues with our products and/or services, please contact our Customer Care team. Get all the latest information about new SUB® products, services and discounts via email and social. You can always opt-out.